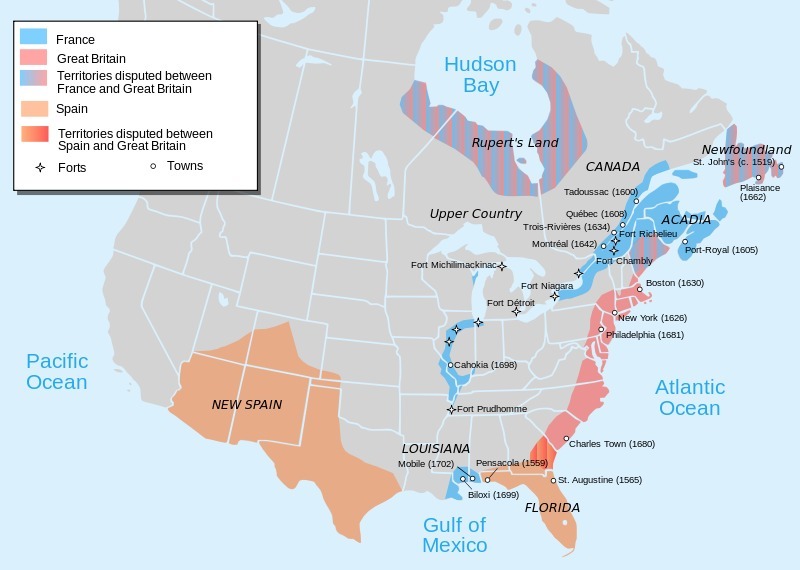 A map depicting European occupation of North America in 1702, map made in 2010. Areas that are a solid color represent approximate areas of occupation, rather than officially claimed lands, which were generally much larger. Areas with conflicting claims are depicted with color gradation, and may or may not be occupied by either side. Many of these land claims also intersect lands claimed by American Indians, which are not shown. 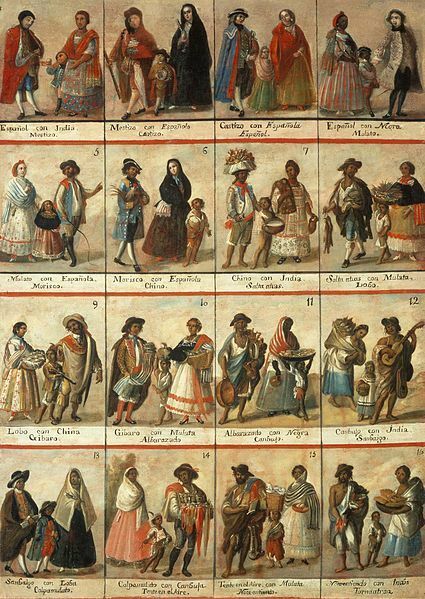 Racial classifications in Spanish colonies in the Americas, ca. eighteenth century, courtesy of Museo Nacional del Virreinato, Tepotzotlán, Mexico. By the end of the eighteenth century, sexual interactions and intermarriage between Europeans, Africans, and American Indians in Spanish colonies led to a large interracial population and wide range of recognized racial categories. By the end of the seventeenth and early eighteenth centuries, English colonies took up much of the Atlantic coast and eastern interior of North America, with the exception of Spanish Florida, Spanish Mexico, French Canada, and French Louisiana. This meant that the English system of New World slavery, and concepts of racial hierarchies, largely shaped how this labor system developed in the colonies that later formed the original United States. While the main goal of all Atlantic World planters purchasing from the trans-Atlantic slave trade was to acquire labor to produce lucrative exports, legal and social terms for slavery varied within different European colonies, and changed significantly over time. For example, Spanish, Portuguese, and to a lesser extent French settlers from along the Mediterranean Sea often had greater exposure to sub-Saharan Africans through maritime trade systems established before the trans-Atlantic slave trade. Historian Frank Tannenbaum argued that this prior exposure translated to greater openness towards manumission (where individual slaveholders could choose to free their slaves), multicultural exchange, sexual relationships, and even intermarriage between Europeans and Africans. In contrast, northern European settlers and traders, such as the English and Dutch, had less prior exposure to sub-Saharan Africans, or to Mediterranean slavery systems. Their laws for establishing chattel slavery formed primarily in the context of the New World, with a heightened economic incentive to secure slavery for plantation agriculture through rigid racial hierarchies. 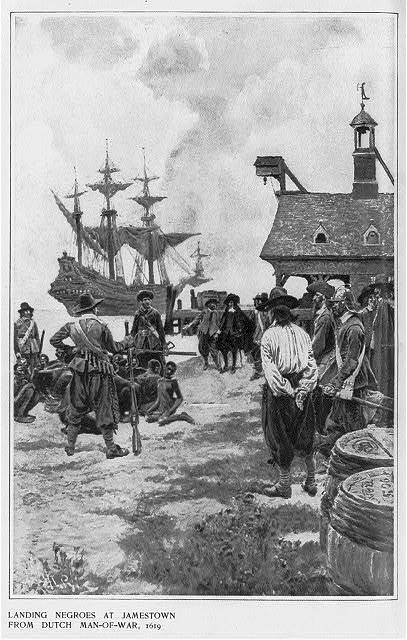 "Landing Negroes at Jamestown from Dutch Man-of-War, 1619," illustration in Harper’s Monthly, 1901, courtesy of Library of Congress. The enslaved Africans depicted in this painting were reportedly the first to arrive in English North America in 1619. 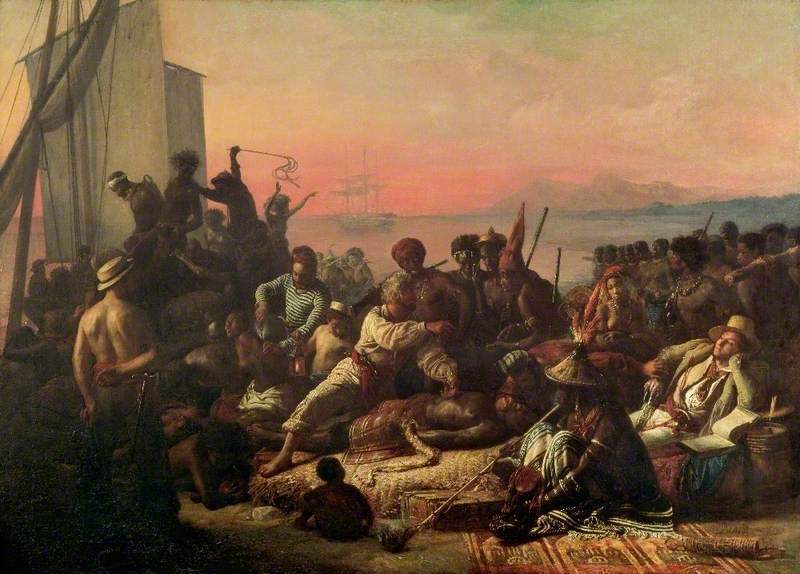 "The Slave Trade (Slaves on the West Coast of Africa)" by François Auguste Biard, oil on canvas, ca. 1833, courtesy of BBC Paintings. Initially, captives in the trans-Atlantic slave trade came from coastal port areas of West and Central Africa. As demands for more enslaved labor increased in the Americas, the slave trade in Africa expanded, and more captives originated from deeper in the interior. Although Africans arrived in North America with Spanish explorers in the sixteenth century, the earliest documented evidence of Africans in English North American colonies dates to 1619. In an account from this year, crewmembers from a Dutch ship traded approximately twenty enslaved Africans to settlers in Jamestown, Virginia. The crew consisted of privateers who had pilfered these captives from a Spanish ship. Privateering conflicts in the Atlantic were a regular occurrence between European rivals in the seventeenth century. Before English and later U.S. traders established direct trade relationships on the West African coast, many colonists in North America accessed the trans-Atlantic slave trade through privateering, or by acquiring enslaved Africans and Amerindians from English colonies in the Caribbean. In the seventeenth century, African captives in North America often came from Atlantic African ports and coastal areas with a long history of European trade relations. Some historians have identified these Africans as Atlantic Creoles because of their intimate knowledge and experience with European customs, languages, and social structures. In the early decades of European settlement in North America, Atlantic Creoles could sometimes use their multicultural experiences and identities to negotiate the terms of their enslaved status, and even obtain freedom, though this was not the norm for the majority of enslaved Africans. As demands for more enslaved labor increased throughout the Americas, the trans-Atlantic slave trade in Africa expanded, and increasing numbers of Africans forced to the New World originated from the interior of West and West Central Africa. In contrast to Atlantic Creoles from the coast, African arrivals from the interior brought diverse cultural, spiritual, and political customs, and they often had less prior experience with European languages, customs, or diseases. The expanded slave trade, combined with increasingly extreme labor conditions and disease exposure in growing plantation economies, meant that mortality rates were temporarily higher for enslaved Africans throughout the Americas in the late seventeenth and early eighteenth centuries, including in English North American colonies. Survival rates in North America began to improve again during the late eighteenth and nineteenth centuries, as planters sought to maintain a domestic slave population through new generations of enslaved African Americans, particularly after the legal end of the trans-Atlantic slave trade to the United States in 1808. With the rise of plantation systems and cash crop economies in the late seventeenth and eighteenth centuries, slaveholders had an economic incentive to enforce racial hierarchies to ensure the enslavement of Africans, while also guarding privilege and freedom for white Europeans. They also had a military incentive — increasing slave population numbers to provide plantation labor also meant a greater threat of slave rebellions. The development of the plantation complex in English North America in the late seventeenth century, particularly in the southeastern colonies, triggered a major shift to more oppressive racial hierarchies and legal restrictions for enslaved populations. In areas where slaves formed a large portion of the overall population, such as the Carolina Lowcountry, these rigid laws developed rapidly. 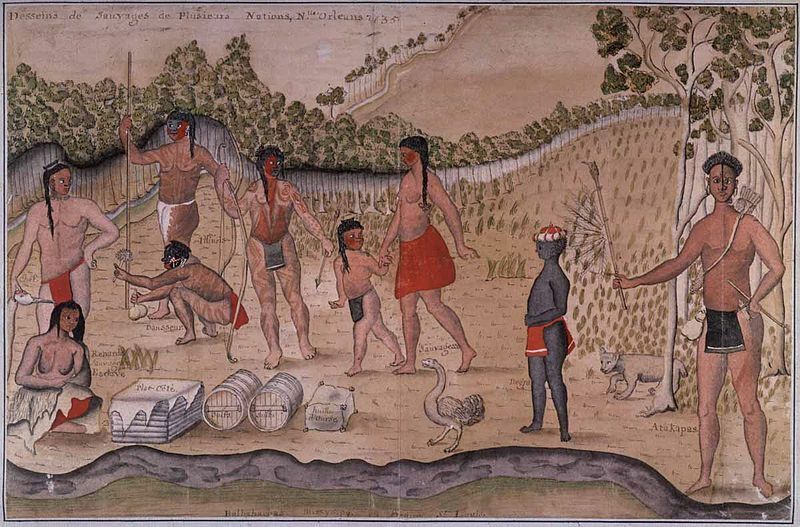 Watercolor painting of southeastern American Indians and an African child, Alexander De Batz, French Louisiana, 1735. French Louisiana demonstrated more fluid race and slavery experiences before the rise of plantations in this region in the late eighteenth and nineteenth centuries. 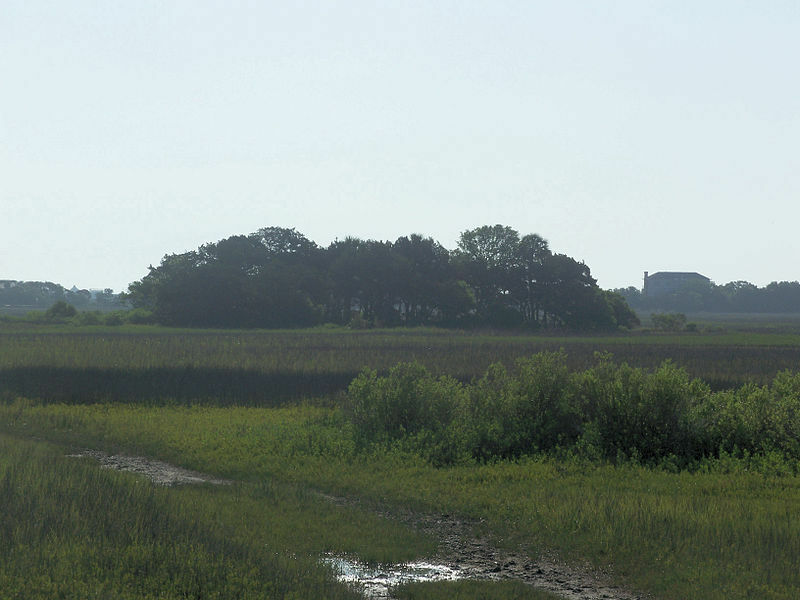 Former site of Fort Mose, Fort Mose Historic State Park, photograph, St. Augustine, Florida, 2008. Escaped slaves from Carolina and Georgia were recognized as free in Spanish Florida, as a military tactic by the Spanish to destabilize the English plantation economy. Free Africans were often taken into the Spanish militia, at sites such as the Gracia Real de Santa Teresa de Mosé fort north of St. Augustine (also known as Fort Mose), which was established in 1738 by the colonial governor, Manuel de Montiano. The military leader at the fort was a Creole man of African origin, who was baptized as Francisco Menendez by the Spanish. In contrast to southeastern North American English colonies such as Virginia and Carolina, settlers in French Louisiana in the late seventeenth and early eighteenth centuries initially focused on trading with American Indians and searching for mineral deposits rather than developing plantations. Though French Louisiana settlers attempted to develop tobacco and indigo plantations in the 1720s, an alliance of Natchez American Indians and escaped Africans led a rebellion that prevented this development. The Natchez Rebellion did not end slavery in this region, but it allowed for more fluid legal definitions and experiences of race, slavery, and social status found in regions without a dominant plantation economy. In Louisiana, sugar plantations would not effectively develop until the end of the eighteenth century, when the Haitian Revolution (1791-1804) ended Saint Domingue's dominance over the sugar trade in the Caribbean, allowing space for competitors in this lucrative market. In Spanish Florida (first settled in 1513), settlers purchased enslaved Africans for various forms of labor, but scholars argue that slavery in this context proved less restrictive. As a military tactic, the Spanish offered freedom to slaves who escaped from their English rivals, particular from the nearby English colonies of Carolina and later Georgia. This led to various free African settlements in Florida composed of runaway slaves. These escaped Africans often intermixed with Seminole American Indians in northern Florida. By the nineteenth century, tensions between African and American Indian Seminoles and the United States government led to a series of violent conflicts called the Seminole Wars (1814-19, 1835-42, 1855-58). A plantation economy based on enslaved labor did not fully form in Florida until it became a part of the United States in the early nineteenth century.